If you haven't read the book yet, you can read these excerpts to see if it's a book you think you might like to read. If you have read the book, this page has some interesting discussion questions. You can use them in your classroom or start a book club with your friends. a local bookseller or online. 10-year-old Andy and his mother need a change and decide to spend the summer in upstate New York with Grandma. In first person narrative, this novel, written in gentle, lyrical language, follows Andy’s journey as he struggles to find the courage to move on after the death of his father. 1. When Andy’s best friend, Anthony, moves to Colorado, how does Andy cope? What are some strategies you could use to cope with the loss of a best friend? 2. What do you think Mom means when she says, “Our lives are like novels”? Is this a simile or metaphor? List one simile and one metaphor from the book and describe what you think the author means. Create an original metaphor/simile. 3. Andy lives in Minnesota but travels to upstate New York to stay with his grandmother for the summer. Map the best car route Andy and his mother might take. Which states will they travel through? Begin the trip in Saint Paul, Minnesota, and conclude in West Carthage, New York. 4. How do you feel when you pray and you think God does not answer your prayers? What kind of sign(s) does God send to Andy to indicate He is listening? 5. Grandma asks Andy to gather apples for baking. Where does Andy find those apples? Why does Grandma insist on using only those apples for baking? 6. Pretend you are accompanying Andy and John on their fishing trip. Describe the bait and the fishing techniques you would use to catch your first fish. How does going fishing with John help Andy cope with the loss of his father? 7. What role does the neighbor, Mrs. Sackets, play in the story? 8. Mrs. Sackets and Mom share an activity that began when Mom was in school. Mrs. Sackets and Mom create a poem between them. Mrs. Sackets writes one line and then passes the paper to Mom so she can write the next line of the poem. Choose a friend and create a similar poem with at least 10 lines. 9. What is CWS? Why is Grandma trying to cure Mom of CWS? 10. “…a long walk in the woods is a perfect way to listen to God.” Why? 11. Is the mosquito really the state bird of Minnesota? If not, what is? 12. Why does Andy have trouble making friends at soccer camp? Why doesn’t Andy want to be friends with “Sweeper”? 13. What is crow’s nest? What excuses does Mom give for never making crow’s nest? 14. What is Mom’s clock made out of? Explain how Dori made Mom’s clock. 15. How do a soccer ball, Anthony, and Katie help Andy adjust during his "Summer of Courage"? 16. Who removed the “No girls allowed” sign from Uncle Greg’s club house and why? 17. What does Anthony have to say about Andy’s friendship with Katie? 18. What is the significance of the stars in the night sky for Andy? For Katie? 19. What does Andy remember about his dad’s hands, his voice, and his laughter? Why is it important to him that he remembers? 20. How does Andy celebrate his dad’s birthday? 22. Why is this Andy’s “Summer of Courage”? 23. Discuss the group Fifty Lanterns as mentioned in this novel. What does it have to do with Mrs. Sackets and her solar lantern? 24. How do you think Mom feels about John by the end of the novel? Have her feelings for John changed over the years? If so, how? If not, please explain. Do you think Andy and his mom will go back to Minnesota? Why or why not? 1. Fifty Lanterns – what is the function of this real organization? 2. Which states have designated the apple blossom as the state flower? 3. How many dishes/recipes can you name that are made using apples? 4. Draw a map of the town where Grandma lives, as described on pages 6-7. Include points of interest such as: Grandma’s farmhouse, pharmacy, cemetery, traffic lights, Mechanic Street, the Black River, etc. 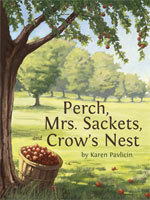 Define these “C” words, found in this novel: chickadee, crucifix, compost, crow’s nest, and constellations.